This study informs national educational policy for developing cognitive and social skills in digital environments across ages 4-18 years. It answers core questions in developmental and educational science around the nature of skills and teaching in digital environments, and the role of families or whānau. With this information, researchers are able to link the developmental pathways with increased educational outcomes, and to estimate the separate and combined effects of school and family influences. Developing in Digital Worlds will provide new knowledge about optimising teaching, learning, and family engagement using digital technologies for end users. Through adopting Vision Mātauranga policy, we will provide equivalent answers and knowledge for Te Marautanga o Aotearoa, where knowledge transfer will be maximised by using existing national networks. In contexts where students have their own devices and teachers employ innovative digital tools and pedagogies (such as interactive dashboards and classroom sites within and beyond school), several outcomes are possible. These include new ways of teaching and learning, both teaching and learning being enhanced, and parental support for learning affecting further change. There are also potential problems which we need to know about, particularly where young people are interacting online in unregulated spaces, their potential exposure to misinformation and constraints on attention focus (such as regulating distraction). Our focus is on three sets of skills: those important for interacting with others; those important for managing oneself; and those important for thinking. 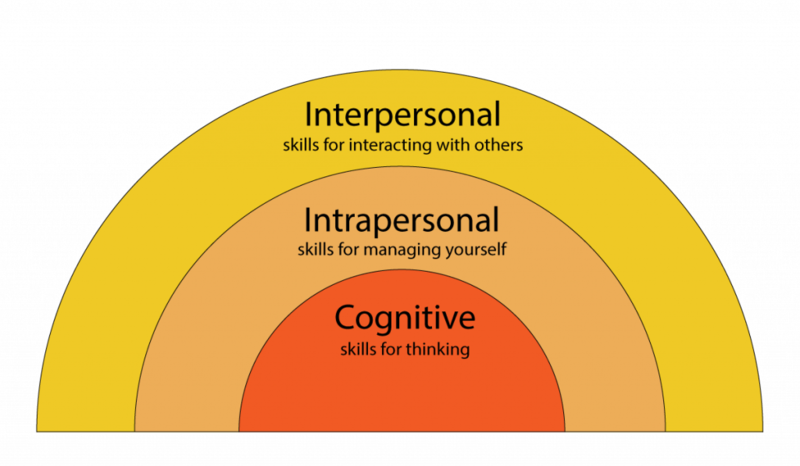 In addition, our interest is in how teachers can effectively promote these cognitive, intrapersonal and interpersonal skill sets in different subject areas (English, mathematics, and science). We are equally interested in how parents guide students’ access and use of devices to develop 21st century skills in out- of-school contexts. In Phase One of Developing in Digital Worlds, we asked 36 teachers about how they use digital environments to teach cognitive, intrapersonal and interpersonal skills. 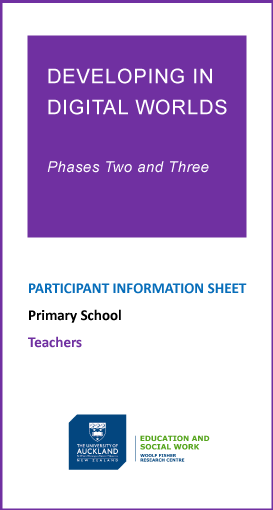 The teachers’ viewpoints are summarized in a report which you can view by clicking on the blue infographic above. Developing the cognitive and social skills of children in digital environments will have flow-on benefits in student achievement, employment, and national growth. The study is concentrated in low social-economic status communities, helping to solve our problem of a high quality, low equity education system. By mapping the results onto the New Zealand Curriculum, Te Marautanga o Aotearoa, the educational benefits will reach all children. This will aid New Zealand’s economic growth and the social and economic wellbeing of family and whānau. A focus of the study is to develop Kaupapa Māori frameworks to represent the target skills, instructional designs, and programmes. This study is uniquely placed to achieve this, with Māori researchers working on the project and Māori medium kura using Te Marautanga o Aotearoa. Above all, Developing in Digital Worlds will deliver substantial benefits to schools and communities, and capitalise on investments in digital skill development. New Zealand needs to get behind the local initiatives that exist, research them, and develop the teaching tools to achieve these outcomes. 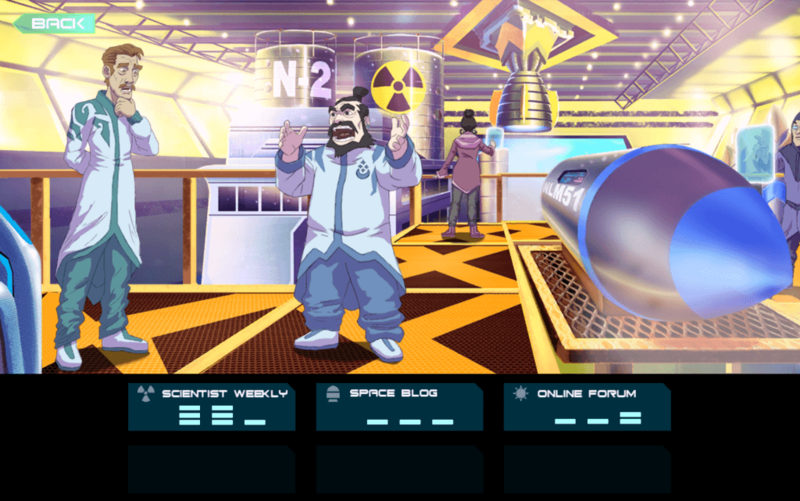 A screenshot Astria: Countdown to Impact, an educational game and one of the digital tools designed for the study. During the Developing in Digital Worlds study, we designed and created digital tools to support student development of a key set of 21st century skills. In providing a specific set of guidelines and activities, the tools function as instruments that assist students to cultivate skills like argumentation (systematic reasoning) and critical literacy. The discussion board, a tool in which students post comments to a platform such as Google Groups, aids them to further develop perspective taking, use of evidence to support their reasoning and an integrated synthesis of their own and others’ viewpoints. The game Astria: Countdown to Impact assists students to develop critical thinking skills and vocabulary skills as they attempt to save a doomed planet from destruction. 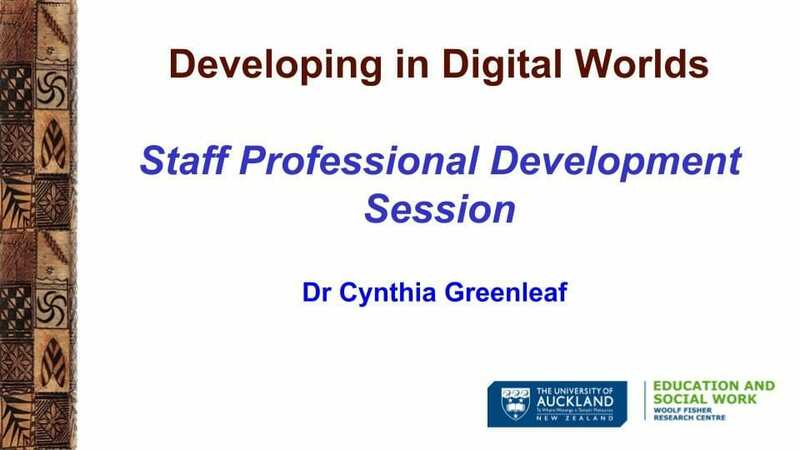 Dr Cynthia Greenleaf, a key researcher on the Developing in Digital Worlds team, presented two staff development sessions at our partner schools in 2018 for teachers to deepen their understanding of the argumentation findings during the profiling phase. One of the findings, for example, is that 80% of students who participated in Google Groups discussion boards only articulated a single perspective. Although the project is promoting digital discussion boards as an innovative tool for evidence-based argumentation online, how can teachers create an environment that supports ongoing discussion and the integration of others’ perspectives? Working face to face with upwards of 60 teachers at each workshop, Dr Greenleaf with our local researchers Jacinta Oldehaver and Naomi Rosedale, facilitated teacher engagement with the Developing in Digital Worlds findings in practical ways. Collaborative norm setting: creating a series of classroom norms with students that supports their participation in discussion. Critical reasoning task: providing an unresolved story or scenario for which students become the investigators. T-chart to make reasoning visible: using a specialized chart with “evidence” from the scene on one side, and the significance of each piece of evidence on the other. Debrief to “Go Meta!” and refine/augment norms: prompting students to think about how they engaged in the “investigation” exercise. Please note: The unresolved story or scenario example comes from George Hillocks’ essay, “Teaching Argument for Critical Thinking and Writing: An Introduction” published in English Journal (2010, volume 99, issue 6, pages 24-32). The T-chart is a variant of the Metacognitive Note Takers chart which was published in Leading for Literacy by Cynthia Greenleaf, Ruth Schoenbach, and Lynn Murphy (Jossey-Bass, 2012, page 104). The Metacognitive Note Takers chart is available as a downloadable resource from this page (select “Team Tool 5.7”). Our findings about how teachers are using digital learning environments to teach 21st century skills are based on a number of measures, including classroom observations. The Developing in Digital Worlds research team has been observing teachers at a number of schools for 1 hour each, with particular attention to how teachers engage students in critical thinking, critical literacy, argumentation, self-regulation, empathy, and collaborative reasoning. To download a pdf of our classroom observation tool, click here.